It's off to the rabbit hole for those that feel inclined as pre-Nintendo Direct rumours swirl around the web. Having look at the apparent leaks we're not fully comfortable on their accuracy or whether it's something that should even be shared in the first place; yet an actual trademark is hard to ignore. If you don't want to know what it's called, you probably shouldn't have clicked on this and should definitely not read further. For those that are interested, read on. Rather like with Pokémon Sun and Moon it seems that trademark listings have squeezed out ahead of a potential reveal. This one was dug up by NerdLeaks - filed today, it's for 'Monster Hunter Generations'. Filed by Javier Ungria López, if you search 'Monster Hunter' at this link you can see that this representative is listed for previous franchise trademarks by Capcom, though this is the first in quite a few years. As for what 'Generations' could be, a sensible suggestion is that this could be a localisation of Monster Hunter X (Cross) for 3DS; that would be no surprise as it's been hugely successful in Japan and Capcom will surely want to build on positive Western momentum from Monster Hunter 4 Ultimate. Of course, trademarks don't guarantee games, so this is marked as a rumour - nor do we see this as a smoking gun at this stage for the supposed broader Direct 'leaks' on the web. If they're proven right then it'll be interesting, but we've had many, many of these leaks that turned out to be wrong. This trademark does exist, though, that much can be said with some confidence. Are you hoping that this is a cue for Monster Hunter goodness in the upcoming Nintendo Direct, or do you think it's unrelated and nothing to get excited about? Let us know in the comments. Oh man, people are gonna be salty after knowing about this leak (because they'd rather see it in the Direct without knowing about it beforehand). Unless they announce a localization for MHX for the near future and this is a completely new game that comes in like a year, which I'd be completely cool with, I want MHX so badly! I would be happy to learn that my prediction for MHX not coming west is wrong. please be for wii u please be for wii u please be for wii u!!!!!!!!!! Time to start praying to every god in existence, maybe one will respond with a yes. I just liked the picture caption. Nice one. As @rjejr suggested in the other article, it's quite possible Monster Hunter Generations could be Monster Hunter Stories. After all, I don't think they'd change the name "X" to Generations for such a main series entry. As I mentioned earlier today, I would definitely not expect any major 1st party reveals. Nintendo needs all the ammo for E3 they can get to build hype (particularly this E3)- so it goes without saying that it would be foolish of them to pillage from their big moment just to satisfy a few eager fans now, in March. @JaxonH I mean MHX contained areas from all the past entries and focused on that, I think that translates to Generations pretty well... Meanwhile I don't see how it relates to Stories. I see it as stories told thought the generations. Simple as that. But who knows. Just sayin, it's a possibility. Kimishima assigned the Nintendo Ninjas to guard the NX. None were left to guard the Wii U and the 3DS. I personally believe, if this rumor is true, that MH Generations is the localization for MHX. It would seem strange to me if Capcom decided to localize MH Stories, a spin-off that hasn't even been released in Japan yet, first before localizing MHX, a (more) mainline MH. EDIT: Seems like my prediction was correct. MH Generations = MHX. HYPE!!! They changed "G" to "Ultimate"... Generations from "X" seems reasonable. Why can't I get into this series? Not really caring for the 3DS games lately. If only there was another Monster Hunter on home console like MH3U. I think we will get some info on the Nintendo accounts club system, Zelda Twilight Princess which gets released the next day here in the states and mention of the 30th Anniversary of Zelda festivities, maybe (a big maybe) a pinch of Zelda U that's a real big maybe LOL also Hyrule Warriors Legends is only a couple weeks away here. I'm hoping for some Star Fox news and even some Metroid Federation Force news would be awesomeness the more I ponder about it the more I've become interested in it. Any way it goes I really hope it's an awesome Direct with a couple surprises we Nintendo fans are over due . I wouldn't be surprised if this is another word for ultimate. Has Nintendo other then Tri ever got the original from Japan. We will probably have to wait another year plus to get the updated version as always. I guess it's time to finish up my awards in MH4U lol. Hopefully this is a very close release but we'll see tomorrow! Oh I never said it wasn't reasonable, just that Stories is also indeed a possibility to consider. And the G was more of a suffix, and they did keep the numeral indentifier- 3. X could be viewed as the numeral indentifier. I kind of want to say I still haven't gotten my money's worth from MH4U, but at 100+ hours, I know that's simply not true. There's still just so much to do, though! I've been slacking on Monster Hunter 4. I enjoy the series but other games just distract me from it. I need to get back to it, I haven't put that many hours into it. Would this debunk supermetaldave if this was true? I don't know man, this gen has been quite an anomaly. First, the main numbered title was released on a handheld instead of a home console. Second, because of that... they skipped the inevitable "Portable / Freedom" title and went straight to the G/U one. And now... Cross. A new unnumbered title running on the 4th gen engine. I wouldn't be so sure Capcom would follow their normal procedures for this one. This could very well be special game in celebration of MH's 10 years (with all the returning towns and areas). I think Generations would fit very well. @JaxonH Apologies in advance if it does turn out to be MHX tomorrow. On the bright side, as you said you win either way. Guess it was weird of me to think Stories since TW didn't even mention it in the article. But who knows? Monster Hunter was never a series I really got into. I bought 3 for the Wii U when it was cheap and then tried the demo off 4 but just could never get into it. Super metal Dave had a list leaked of 1st party software, internally. Had nothing to do with 3rd party. It was also based on NoA marketing, meaning if there's any 1st party titles coming to NA that weren't yet submitted to NoA marketing dept, it wouldn't be on the list either (those should be few though, if any). Assuming it's real of course- but given Pokemon Sun and Moon had Niji_A and Nini_B assets discovered and the leak foretold a 20th anniversary Pokemon game titled "Niji" I'd say it's 100% authentic. Not to mention that Disney Art Academy was confirmed as well. Dude we're getting a Monster Hunter game! No apologies needed my friend. I don't give a rat's *** if it's MHX, MH Stories, or something else entirely. It's Monster Hunter, and that is enough. I'd be to happy if this true. I'd actually be incredibly happy about a Monster Hunter Stories localization. I doubt it would do as well in the West seeing as JRPGs aren't exactly the top genre here, but hot diggity dang if I don't want that game in my collection! If and when it's revealed tomorrow, I will have to roll my eyes at the people who were angry that they were no longer hyped because of this leak. Again, if this is real, it has to be X because that name fits the game perfectly. I'd say it'd be X or Stories. Although I think Generations fits X more. Would like a Wii U title, but it's probably 3DS, so meh. @invictus4000 Why ? Is two games too much for you to handle ? Amazon recently listed a whole bunch of Monster Hunter titles for the Vita (G6 Premium, G7 Premium, G Beginner) which would show Capcoms "passion" for the series, not releasing the missing releases in the west on its current main system and instead, trying to release even more on a de facto dead console. Frontier is on everything but 3DS, PS4 and XB1. The Vita version doesn't point towards anything. @whodatninja @edgedino I bet it will be just another 3DS thing... Devs pulled the Wii U plug before gamers did. I'm one of those who like to see things in direct without knowing anything. It's little too late for that because Nintendolife's frontpage already pretty much spoiled it by telling it's "Monster Hunter" game. @Thegentleman I love your avatar. Back in my day, that's how Pikachu looked! I dont know about you, but for a company that always tries to cut costs by foregoing physical releases entirely, this looks like a collossal waste of money. Why not make it one base game + different digital packs that come with the subscription ? Anyways, that doesnt change the fact that capcom has no clue how to handle the franchise in the west. Monster Hunter on the big screen plz. @JaxonH Umm, X is more of a spinoff. It contains very little in the way of new monsters, primarily focusing on content from past games. You know what the term used for each "era" of those games is? Generation. 1/G/Freedom is 1st gen, Dos/Freedom 2/Freedom Unite is 2nd gen, and Tri/Portable 3rd/3G(Ultimate) is 3rd gen. 4/4G(Ultimate)/X are effectively 4th gen.
@Einherjar hmm...it's not really like that. If I'm not mistaken, you could buy the very first frontier release (if that's even still available) and it'd just update to the latest version right away. I think that's just a Japanese thing to have a retail release of big updates for MMOs, I know Final Fantasy 14 and Dragon Quest 10 did the same thing. Frontier gets a (big) update every..I wanna say 6-9 months with at least one new monster and its equipment + new areas, items, stuff like new pets (Frontier has these small wyverns that help you on hunts) and other MMO stuff depending on the update. Those are free, tho. You only pay for the subscription and any goodies that come with the subscriptions you buy in stores (those physical releases) and that's what you saw on amazon. @CrazedCavalier MHX introduced like 9 or 10 new monsters, ignoring the new variants for Arzuros, Lagombi, Zinogre, Nargacuga, Rathian and Rathalos, Tigrex, Daimyo Hermitaur and Dinovaldo (one of the four new flagship monsters)...and I feel like I forgot one or two. There's a ton of new stuff in the game, but that's never been what marks a new "generation" in the series. MHX shares its engine with MH4 and 4 Ultimate and that is usually what really decides what's part of which Gen. It's not like Pokémon where they only introduce entirely new creatures at the start of a generation. It's also not a spin-off...The Felyne Village games are spin-offs. Stories is a spin-off. Dynamic Hunting and Explore are spin-offs. MHX is just as much part of the main series as MH4U, Tri or Portable 3rd. I just want a Monster Hunter game on a home console again. I don't love it only being on handheld now. 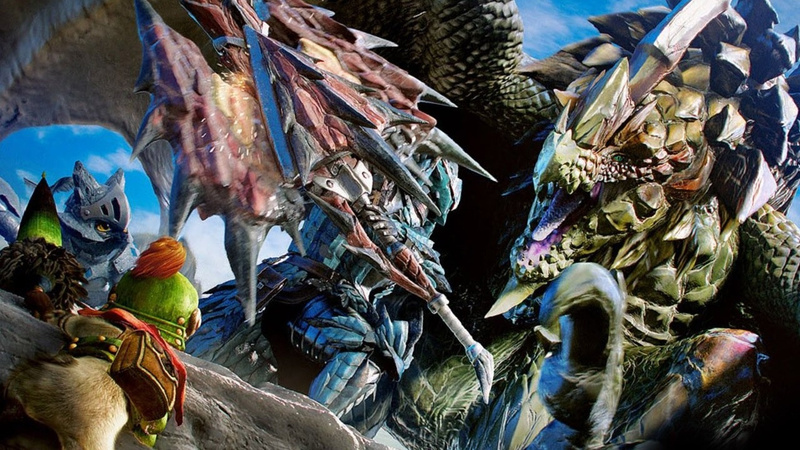 A big proper HD Monster Hunter game would be amazing. My prediction was that the next western Monster Hunter release would be for NX, and arrive on both home/portable versions of the platform. The "Generations" moniker might work well for this. If it's just a western release of X, I'd love to see a cross 3DS/WiiU western release à la MH3U, but I feel like if they were doing that, Japan would already know about it, and the announcement wouldn't be in a western direct. I'll tell you though, that no company knows how to make its series release names/numbers confusing like Capcom. I want Monster Hunter Super Turbo Ultimate Championship Edition Generations!